I'm don't want to say that a video game could save America ... but a video game could save America. OK, maybe I exaggerate, but only slightly. Bear with me here. Unless you're hiding under a rock with no access to media -- social or otherwise -- you're aware of the fact that almost everyone under the age of 30 -- and several of us over 30 -- are playing Pokemon Go. The new mobile game came out last week and has quickly vaulted to the top of the charts on Android and iOS devices. On its day of release, it was on more phones than Tinder. And since Wednesday, the average Android user is spending nearly 60 minutes a day playing the game -- more time than they spend on Twitter. I'm not entirely sure why, but it caught me by surprise. I noticed on Wednesday that three of my Facebook friends mentioned Pokemon. I thought it an odd coincidence. By Friday, it seemed like everyone I connect with on Facebook was talking about it in some way or another. Well, that and #BlueLivesMatter. But by Saturday morning, the seemingly never ending race war on my Facebook wall was replaced by Pokemon. Rather than a Hillary bashing or Trump bashing, it was Pikachu and Team Yellow. Sitting on the bus en route to the Taste of Buffalo Saturday afternoon, I struck up a conversation with the stranger sitting next to me as he played the game. He said a friend got him hooked on it and he was enjoying catching the imaginary beasts. At the Taste of Buffalo, I overheard more than a few people talking about the Pokemon they had caught there. And at a friend's house afterwards, it seemed to be the primary topic of discussion. Sunday, I couldn't take it any more. I had to play for myself. So I downloaded it and installed it and immediately caught a Charmander. I texted my daughters to ask if they were playing. One is. One isn't. The one who is explained why it's so great to live where she lives with water and woods and open areas -- allowing her to catch all kinds of Pokemon. But today's Pokemon experience is what really excites me. Walking down Hyde Park Boulevard in Niagara Falls, I ran into a pair of kids -- probably 13 or 14. I overheard one of them say he was looking for a Pikachu, which excited me, frankly. I said, "Where? The church back there is a gym." We chatted for a bit. Two kids. And a 41-year-old. Talking about imaginary creatures while holding their cell phones. A short while later, I ran into a couple guys -- Joe and Tito -- who told me they were "hunting an Eevee." We walked together for a bit and talked about the game. And a few minutes after that, I ran into three more kids, who quickly hid their phones when they saw me. I asked what they were hunting, and they said they weren't sure. 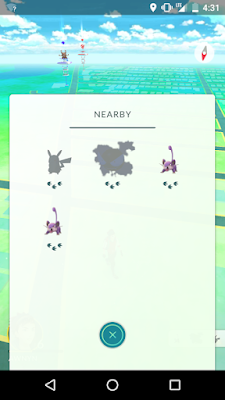 I then mentioned that there was a Pikachu in the area and one of them said, "I know! We're trying to find him." That's eight complete strangers that I talked to in the past three days who I would have normally walked by without a word. Just the typical male head-nod. Eight conversations about Pokemon. No conversations about Trump. To me, that's a definite upgrade, even if I didn't find the Pikachu. And I've read similar stories on social media about strangers meeting and discussing the game. One particularly amusing one about three guys in a park who were almost arrested until they explained they were just catching 'em all -- and convincing the officer to download the game. Even if this Pokemon craze is temporary, it's a reprieve that a very stressed America needs so badly. Rather than black or white, gay or straight, Republican or Democrat, it's all about teams Yellow, Blue and Red right now. People are creating events to catch Pokemon. And at least three businesses that I know of -- The Transit Drive-In, The Old Pink, and Grand Island Fun Center -- .have taken to social media to invite the public to come play there. And on top of all that, it's getting people to go outside and exercise -- or at least walk. So Pokemon Go might not be the game that America deserves, but it is clearly the game America needed. Scott Leffler is editor of All WNY News and proud member of Team Yellow. He writes columns when he feels like it. See, Pokemon Go even inspired this column. It's taking over the world. This column was originally published on All WNY News.